The Ribbon Cliff landslide moved on December 14th, 1872, during (or shortly following) the 1872 earthquake. 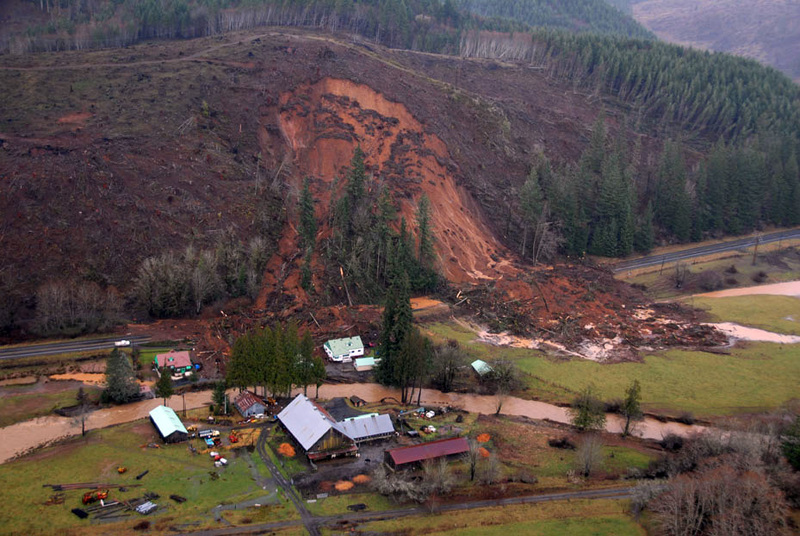 The landslide moved into the Columbia River and blocked it for several hours. It would take some time, but it would be interesting to try and find the locations of slope failures from this landslide. The landslide toe is a bit difficult to determine. 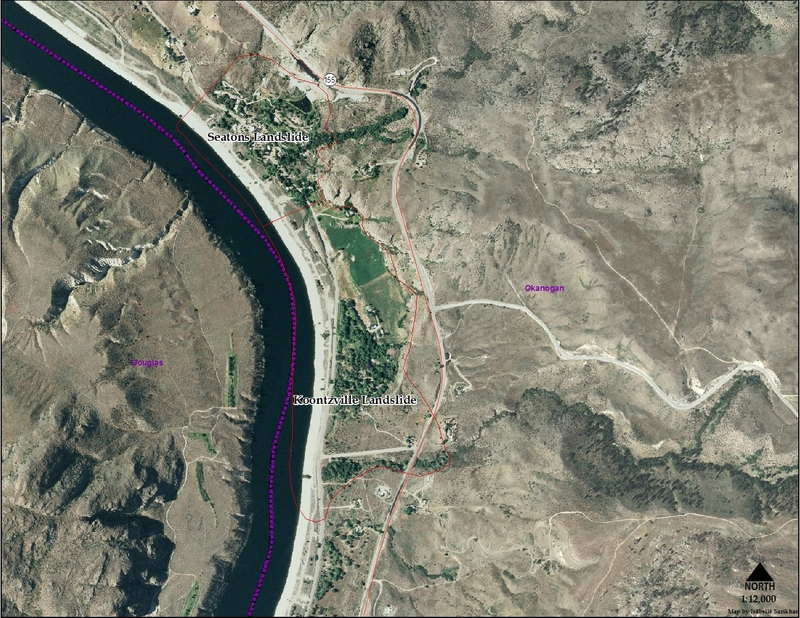 The Rocky Reach Dam, built in 1962, formed Lake Entiat, which inundated the toe of the Ribbon Cliff Landslide. 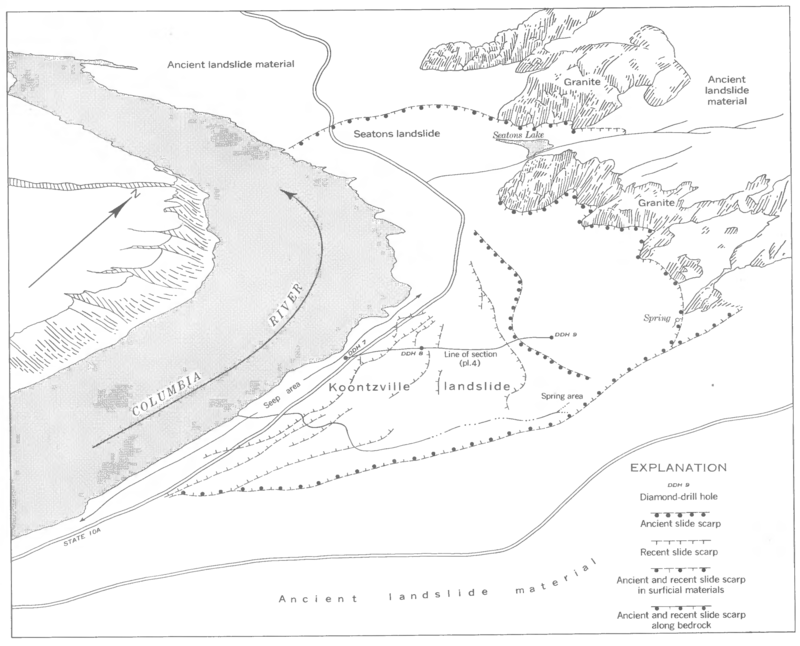 Older topographic maps indicate a probable toe (which is the loosely drawn toe on the map above). 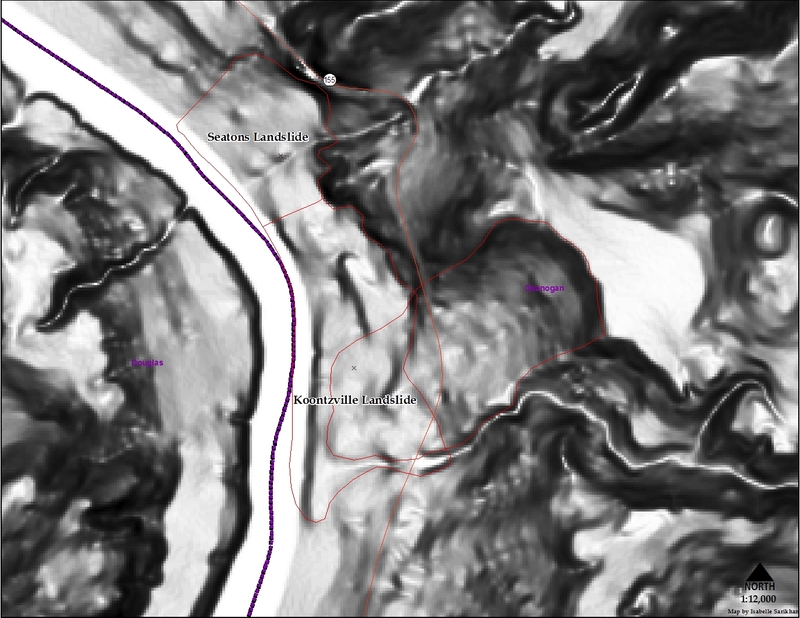 The landslide was drawn to the area mapped out in Madole et al, 1995. 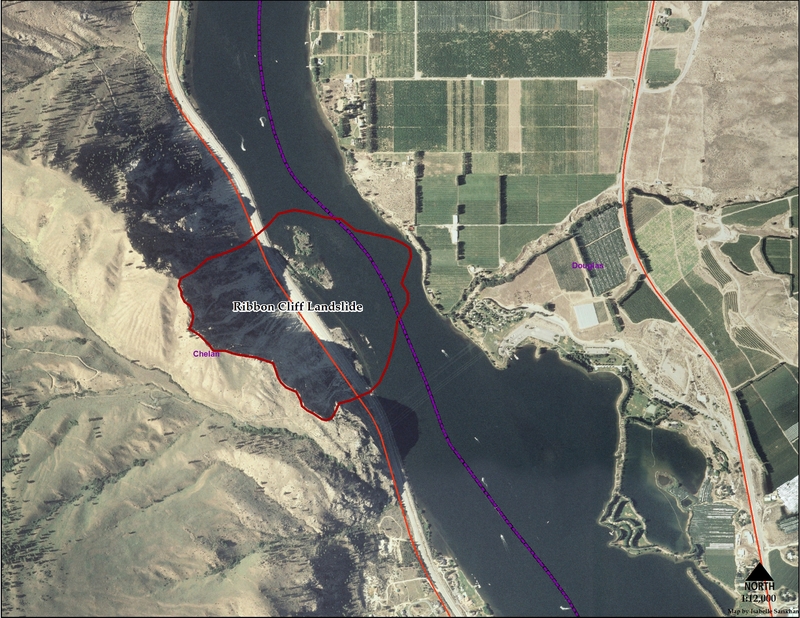 The landslide location is along the Columbia River and was probably subjected to undercutting and oversteepening from erosion. 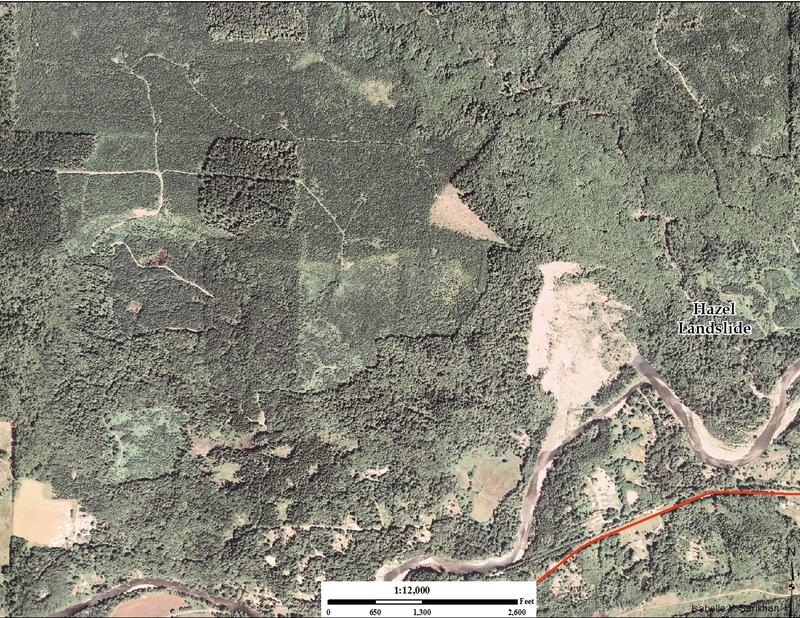 Evidence of landslides (one just north of the Ribbon Cliff Landslide) is evident when looking at aerial photos of DEMs. The landslide itself was probably not a rock fall/topple event, but more of a translational landslide, that carried the mass relatively intact. One of the more interesting summaries of the landslide can be found on this website. It gives a general summary of the landslide (plus some amazing oblique pictures of the landslide). It turns out (like most things in science) that not everyone agrees the Ribbon Cliffs Landslide is from the 1872 earthquake. The 1872 date, beyond the account of the 15-year old youth living in a cabin 3 km up stream, is also based on the presence of Mt. St. Helens Volcanic ash (set W) near the top of the undisturbed talus deposit (absolute maximum date). However, a dendrochronology study by Kienle et al (1978) reported that two of the oldest trees examined and three younger trees examined pointed to a failure date prior to 1872. No evidence was found within the tree rings of disturbance. This could be explained by the mass of the landslide did considerably disturb the trees (if the landslide mass moved as a whole). Kienle, Clive F., Jr.; Farooqui, Saleem M.; Strazer, Robert J.; Hamill, Molly L., 1978, Investigation of the Ribbon Cliff landslide, Entiat, Washington: Shannon & Wilson, Inc., 26 p., 23 figs., 2 plates. 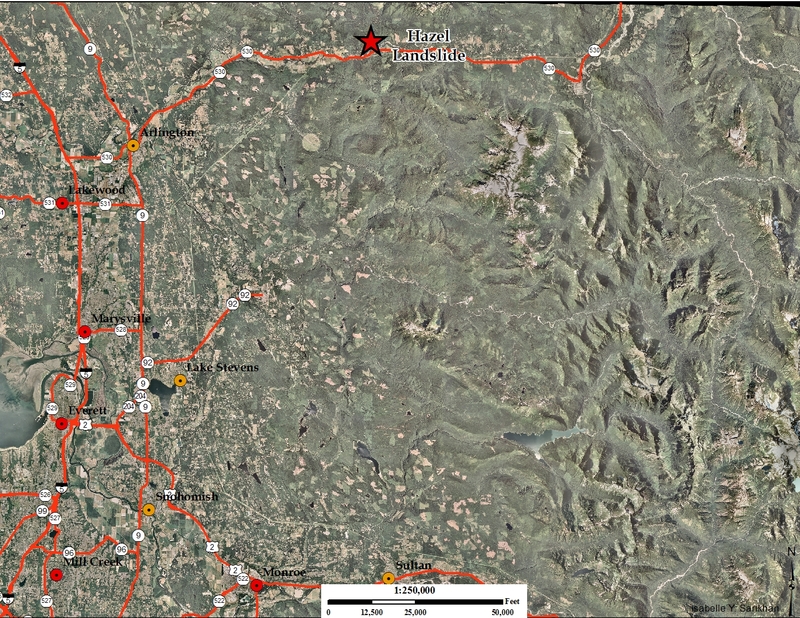 Madole, Richard F.; Schuster, Robert L.; Sarna-Wojcicki, Andrei M., 1995, Ribbon Cliff landslide, Washington, and the earthquake of 14 December 1872: Seismological Society of America Bulletin, v. 85, no. 4, p. 986-1002. 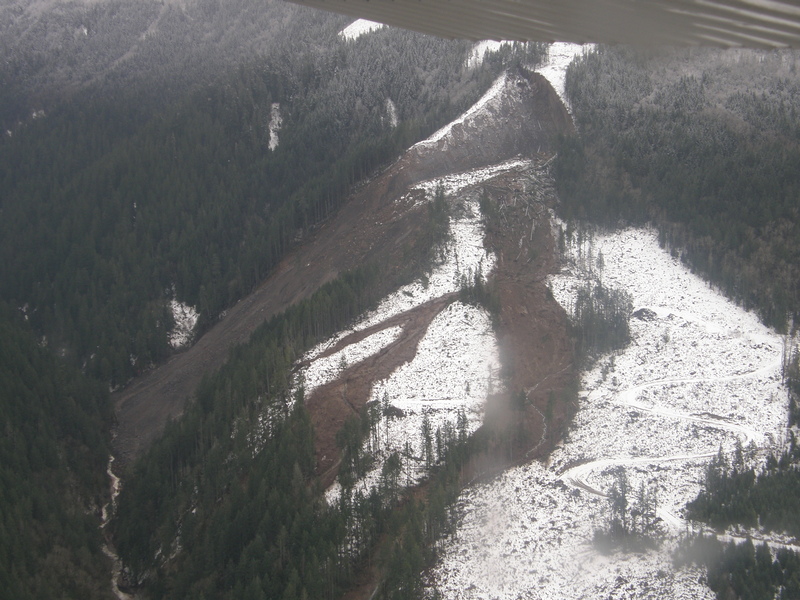 The Hazel Landslide is a persistent deep-seated landslide that is probably driven by groundwater and erosion by the North Fork of the Stillaguamish River. 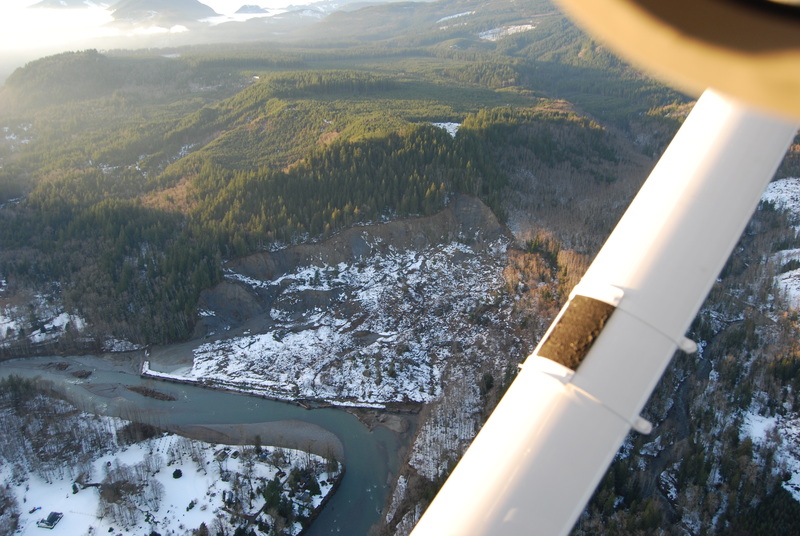 The landslide has caused some headaches for DNR, as a catastrophic failure and partial blockage of the Stillaguamish River around 1988 spurred many to consider logging as the culprit. 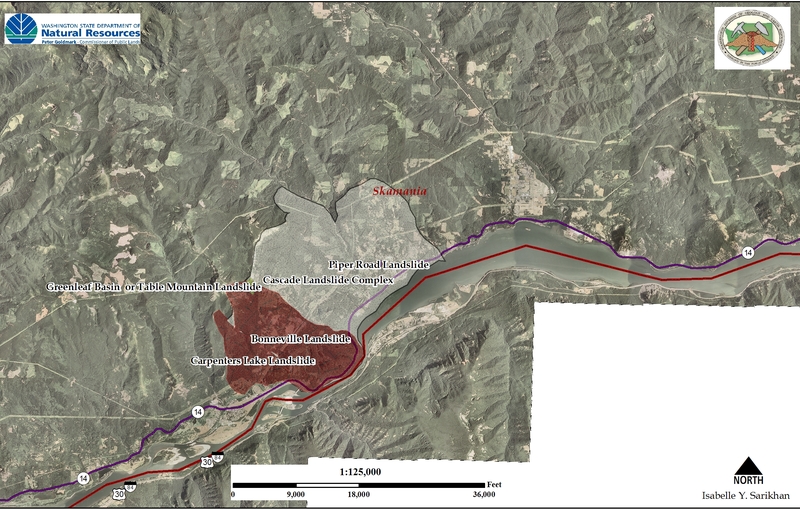 Logging in the northwest area above the landslide came into question as a area that was a groundwater recharge area. The addition of water from the removal of trees was considered to be at least a partial catalyst for the failure of the Hazel Landslide and it is seen as a poster child of what groundwater recharge in sensitive areas can do. 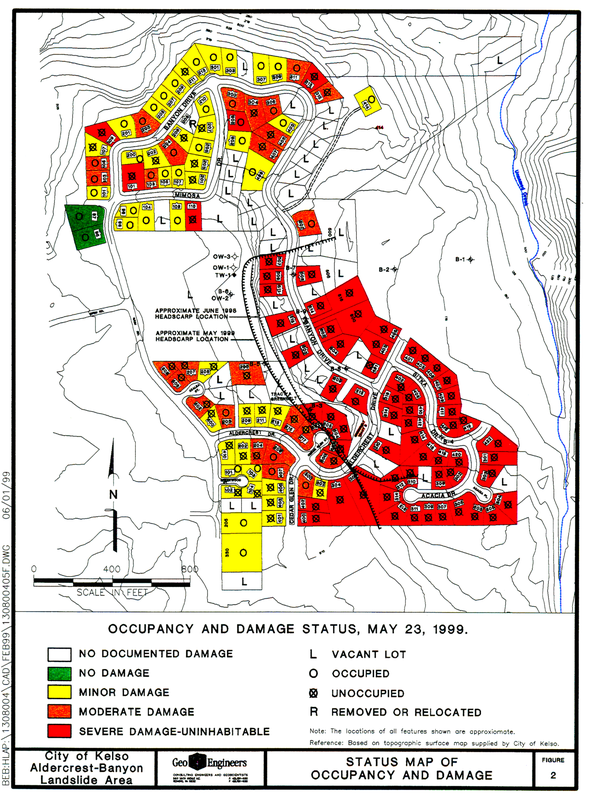 Since 1988 the forest land has recovered and groundwater recharge should have been diminished, but in January of 2006, following a period of prolonged precipitation, the Hazel Landslide once again moved, diverting the river into a small community of houses. 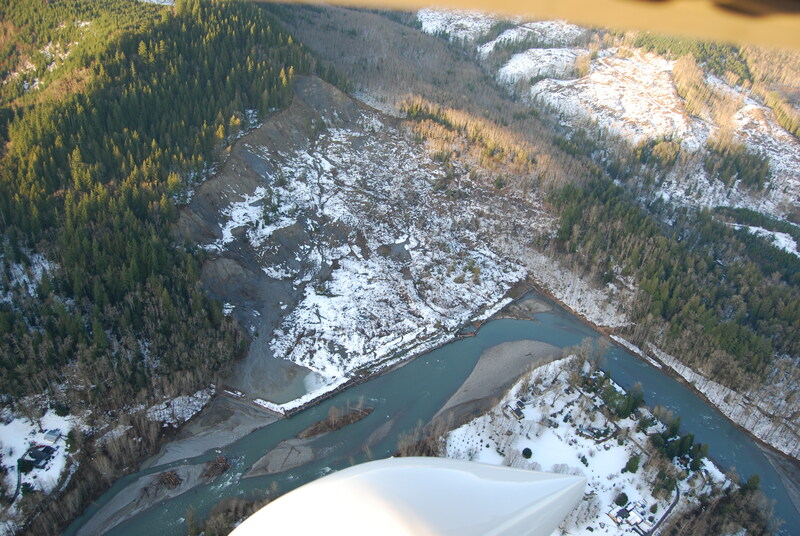 This landslide was another large landslide and has been called the Steelhead Haven Landslide. 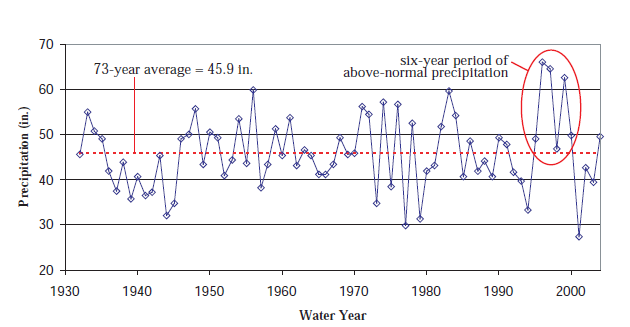 During that month, about 8 inches of rain fell, well above the average 4.5 inches that typically falls during the month of January (in 93 months of record). 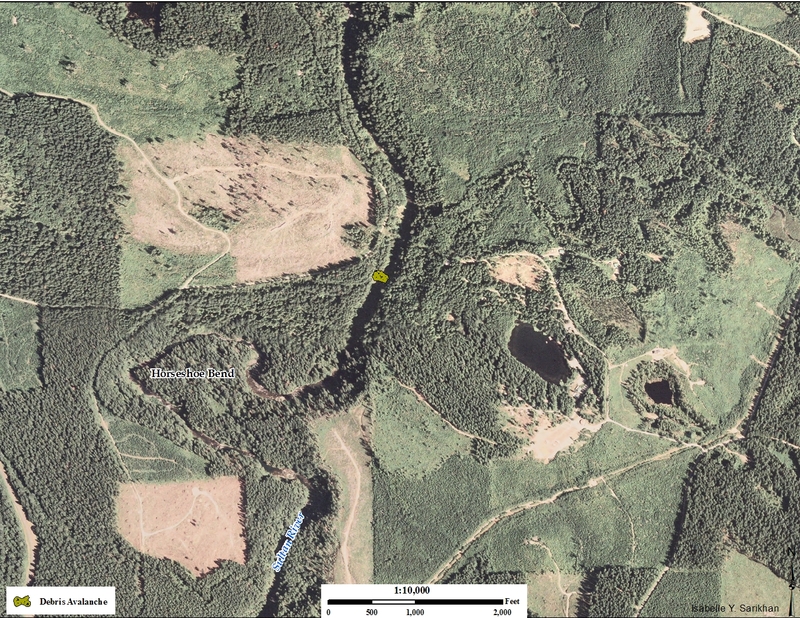 This would overwhelm any recovery that may have occurred with the maturing forest. The landslide produced a lot of sediment, which I hear from some of my sport fisherman up there, caused quite a poor year of fishing. The long term effects might not have been devastating, but with a weakening population of fish, it certainly hasn’t helped any. 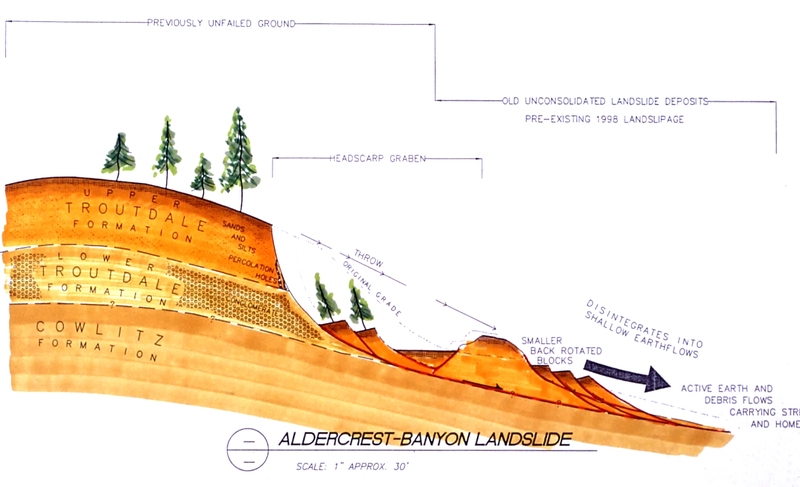 In the landslide world, the Hazel Landslide is certainly one of the more well known landslides. 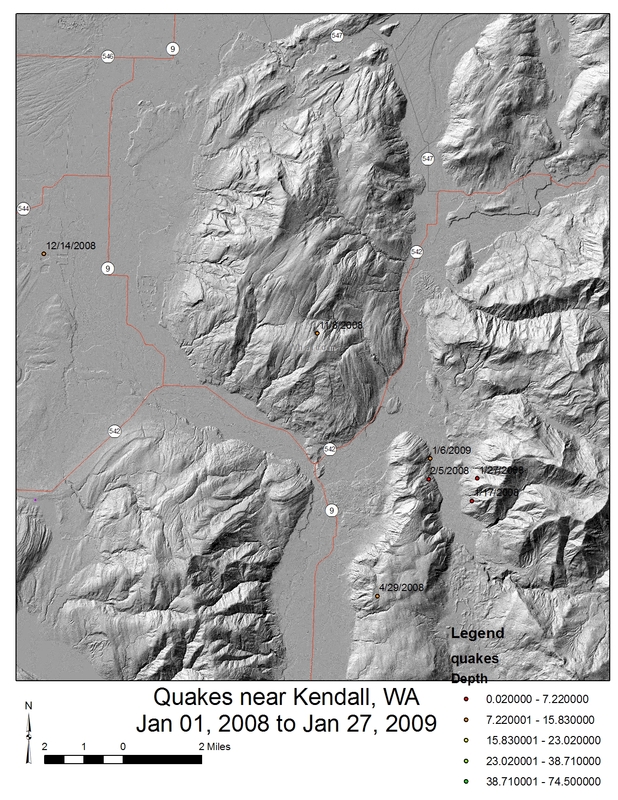 The unstable nature of the glacial lakebed lithology it sits in has caused countless landslides throughout Western Washington and is a legacy of our glacial history. However, it has taught us some valuable lessons in how groundwater affects lacustrine beds and its potential sensitivity to water. 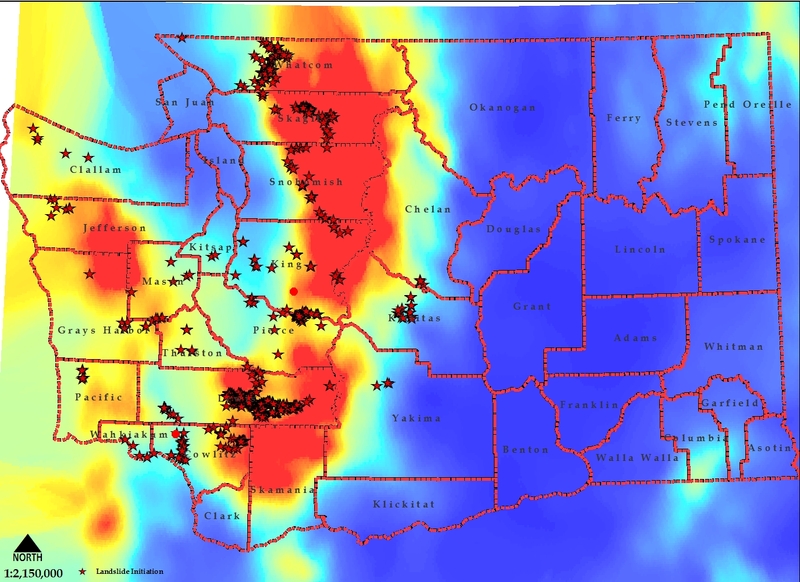 When I first started at DNR, I lived in Seattle (commuting to Olympia), but most of my field work was in or near the Sultan Basin. 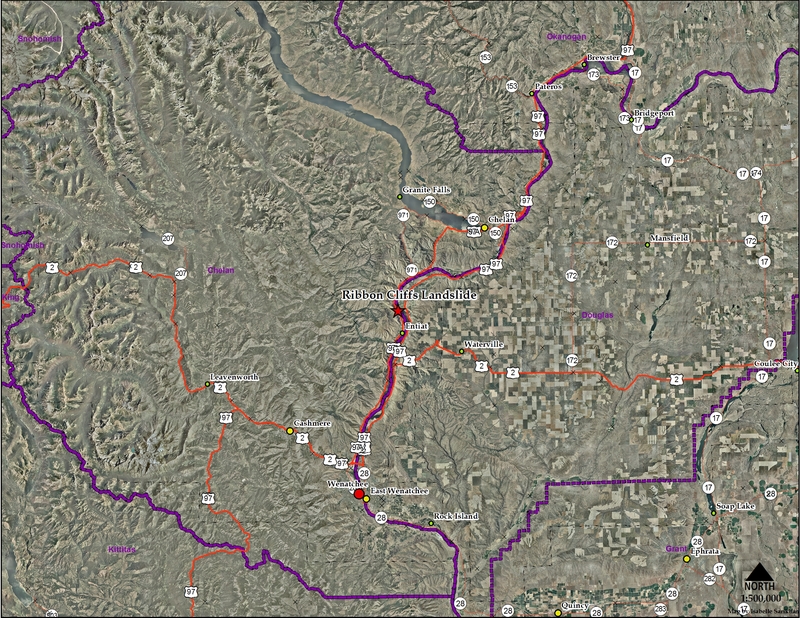 The Sultan River watershed was the first watershed I worked on for the LHZ Project. My first year working was almost comical, every day I was in the field, it rained. In the summer, we would have long stretches of dry weather and one day of rain every couple of week and those were the days I ended up in the field. On December 10th, Pat Pringle and I were in the field investigating the Sultan River basin. We didn’t hike or really get out of the car much due to a torrent of rain coming down. We never quite got over to the area of the Sultan River debris avalanche, but we were just about across the way from it. I did end up heading out there after it failed. On December 11th, a group of Kayakers decided to ride the Sultan, mostly because of the elevated water levels from the storm. During their ride down, they ran into more than they bargained for. A large debris avalanche/fall came down right after the kayakers passed by. As you can see in the video, the landslide dammed the Sultan River for a short time, but eventually over topped/breached the dam. The kayakers, a bit shaken up by the landslide decided to leave the river and hike out and head back to civilization. Unfortunately, they didn’t know the area and headed east of the the Sultan Basin, eventually reaching a small nudist community. They all make it out safely. To make matters worst, the City of Sultan received a report of a large landslide damming the Sultan River. Their main concern was a dam burst flood that would damage the city. 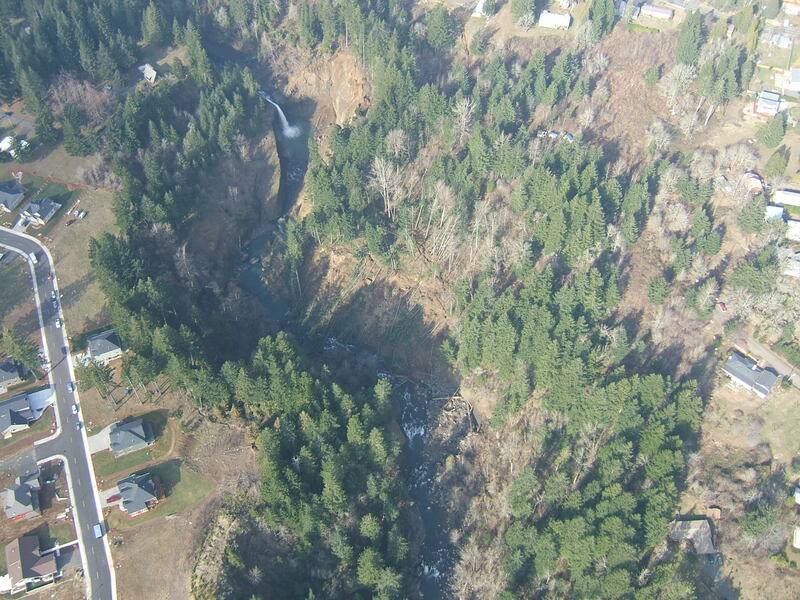 The Snohomish County sheriffs office had a helicopter in the air trying to find the landslide and see how bad the blockage was. This was a real thing to worry about. 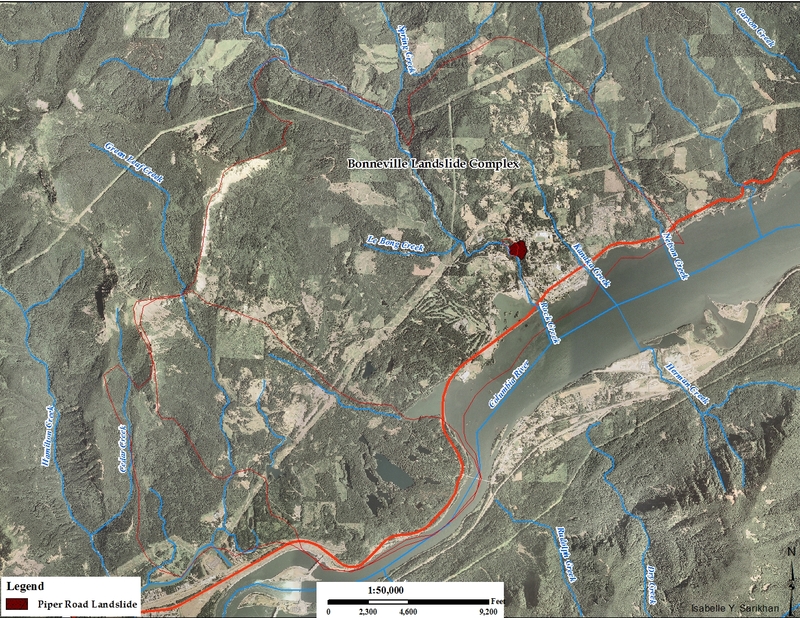 The Sultan River is entrenched and a dam could potentially block a large amount of water. Strangely enough, many of the rapids (that the kayakers seem to enjoy so much) came from old landslides that probably partially or fully dammed the Sultan River and slowly eroded out, just like this landslide. Landslides are rarely caught on video and when caught, they are a valuable source of scientific information. In this video, you can see how the landslide overcomes what almost looks like a small rock that is holding back the mass of material break apart shortly before movement. You can almost calculate the acceleration as it heads towards the river and what happens as a mass of material impacts into the water, the size of the waves and so forth. We can also see how the river responds to the debris dam and how it returns to normal flow without breaching the dam. This video also caught the attention of others and it was part of a Discovery Channel series called Raging Nature. I was interviewed by the show, but I didn’t appear on camera for the show (probably the background river sound, which was really loud). The narrator during the show did say much of the exact words that I said (which was kinda creepy for me). Regional bedrock that includes the Sultan River watershed belongs to the Western Mélange Belt, part of the Western and Eastern Mélange Belts (WEMB) terrain. The WEMB includes Mesozoic (late Jurassic to early Cretaceous) marine sedimentary rocks, along with lenses of Paleozoic limestones, Mesozoic intrusives, and other rich types in fault-bounded bodies that were tectonically juxtaposed (Tabor et al, 1993). The WEMB rocks underwent high pressure, low temperature metamorphism in the late Cretaceous orogeny at about the time they were juxtaposed against the Northwest Cascade System terrain to the North. Bedrock in the Sultan River watershed is mainly composed of the Western Mélange Belt (Phipps et al., 2003; Dragovich et al., 2002). These rocks were deposited during the late Jurassic to early Cretaceous (170 to 100 million years ago) periods (Carithers and Guard, 1945). Sediment was thickly deposited in a marine setting, comprising mostly of silt and mud. Hydrothermal systems and submarine eruptions (similar to black smokers) formed from intruding magma, creating large pyritic deposits (such as the Lockwood Pyrite deposit) and overlaid the marine sediment with volcaniclastic and mafic flows (for example, basalt) material (Olson, 1995; Snohomish County, 1979). This magma chamber underwent differentiation, where the heavier mafic material (rich in iron and other metallic minerals) filtered to the bottom of the chamber and lighter felsic material (rich in silica, such as quartz and feldspar) rose to the top (Stewart, 2005). These rocks were then metamorphosed (exposed to heat and pressure), folded, uplifted and eroded. The metamorphism changed the marine sedimentary and volcaniclastic rocks into argillite (metamorphosed siltstone) and phyllite (metamorphosed mudstone). The granitic magma chamber also experienced metamorphism, altering the granitic rocks into meta-tonalites (light colored granitic rock), meta-gabbros and meta-peridotites (dark colored granitic rock). As the rocks experienced pressure from the west (most likely from the oceanic plate colliding with the North American continental plate), they tilted the stratigraphic section to the northeast. This tilting, along with erosion of the overlying rock, exposed the relict magma chamber (gabbro and peridotite in the west, grading east to tonalite) in the western part of the Sultan River watershed. The metamorphic marine rock, which overlies the relict magma chamber, can be found primarily in the southern and eastern parts of the watershed. The metamorphic volcaniclastic rock, which overlies the marine rock, is located primarily on Blue Mountain, in the northeast part of the watershed. The meta-tonalite rocks, where not overlain by glacial drift, is very stable, even with slopes steeper than 60% (A prime example of this is the large hill, located in T. 28N R. 8E, section 2 and 11). The meta-marine rocks can be unstable, especially when the beds are tilted to near vertical. The north flank of Blue Mountain is an excellent example, where the meta-sedimentary rocks are tilted to near vertical and failures are frequent within the section. The meta-volcanic rocks can be very unstable and appear to be very susceptible to slope failures when the rock is exposed to water. 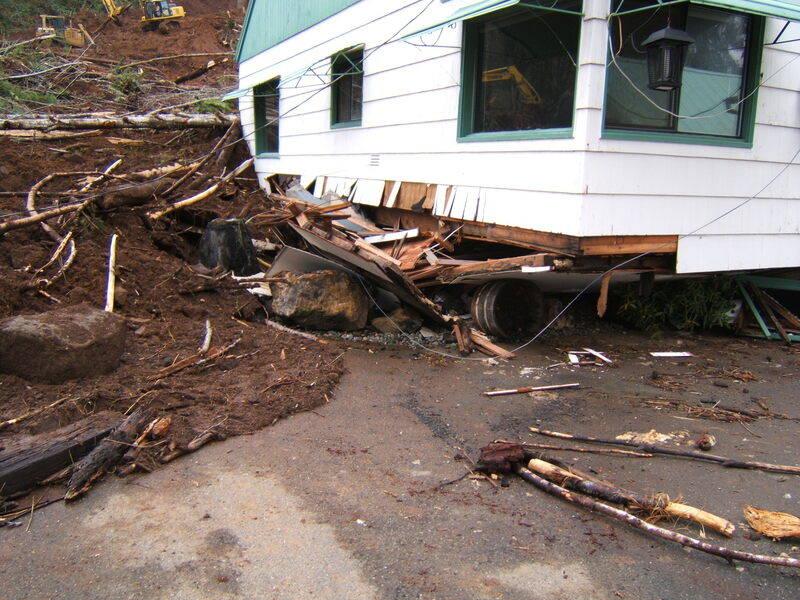 A prime example of this is the water run-off from the radio tower located at the highest peak on Blue Mountain; many debris flows initiated from this deposit, independent from harvest or road construction. Surficial units in the study area consist of continental glacial drift. Other surficial deposits are composed of alpine glacial drift, colluvium, and alluvium. About 14,000 years ago, the Puget Lobe of the Cordilleran ice sheet, which represents the most recent advance of continental ice sheet, flowed into surrounding valleys. This advanced was named the ‘Vashon Glaciation’ locally. Tongues of the Vashon glacier dammed valleys that were tributaries to the Puget Lowlands, creating large ice dammed lakes. Glaciers advanced up the Pilchuck River system and the Sultan valley, covering the northwestern portion of the watershed (Tabor et al., 1993). This blocked the paleo-Pilchuck River, creating a large ice-dammed lake and depositing deltas and lake deposits on the north flanks of Blue Mountain to Bald Mountain. This rising lake eventually overflowed, washed over Olney Pass, and deposited fluvial outwash across the plains in the west and south parts of the Sultan River watershed. 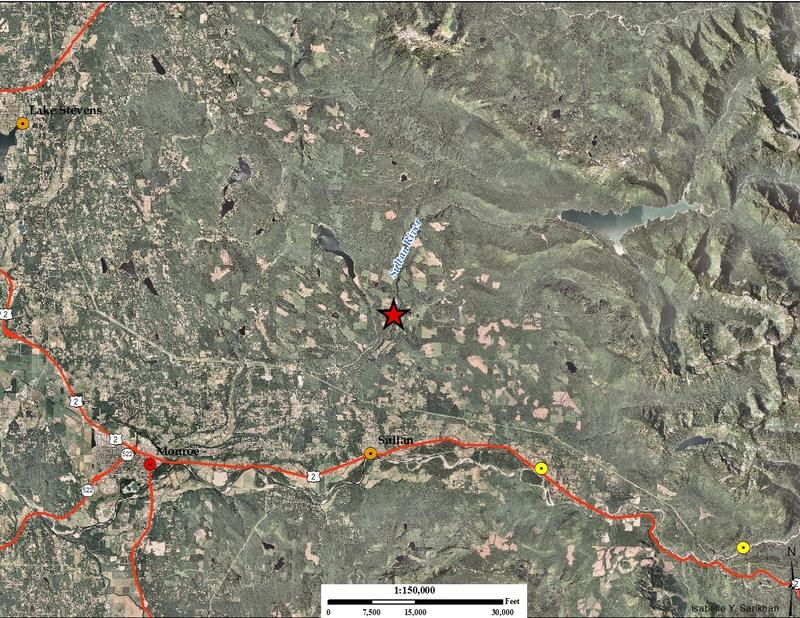 Ice margins near Lake Chaplain and Echo Lake also produced significant outwash towards the town of Startup (Booth, 1990). 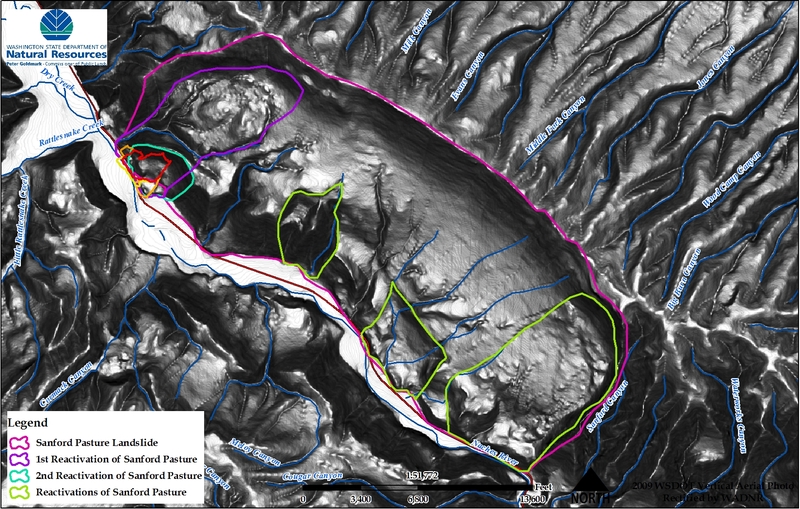 As the glaciers retreated, the terminal moraine (called the Pilchuck plug) blocked the upper drainage of the Pilchuck River, creating the new Sultan River watershed (Coombs, 1969; Bliton, 1989). The Sultan River established a channel, rapidly incised into the glacial material, cut into the bedrock, and became entrenched. This incision is probably due to easily eroding glacial material and isostatic rebound of the bedrock in the area. Old meander bends and channels can be seen near the main channel of the present Sultan River. Near the confluence of the Sultan and Skykomish River, glacial lakes formed by the advancement of the Cordilleran ice sheet, creating thick lake deposits in the southern extent of the watershed (Booth, 1990). These lake deposits formed low-permeability clay and silt layers that perch water and spawn large landslides during high precipitation. The silt and clay layers are commonly overlain by permeable glacial outwash from the paleo-Spada Lake and ice-margin flows. This combination of silt, clay and sand makes much of the hillsides in the southern part of the watershed susceptible to shallow and deep-seated landslides. 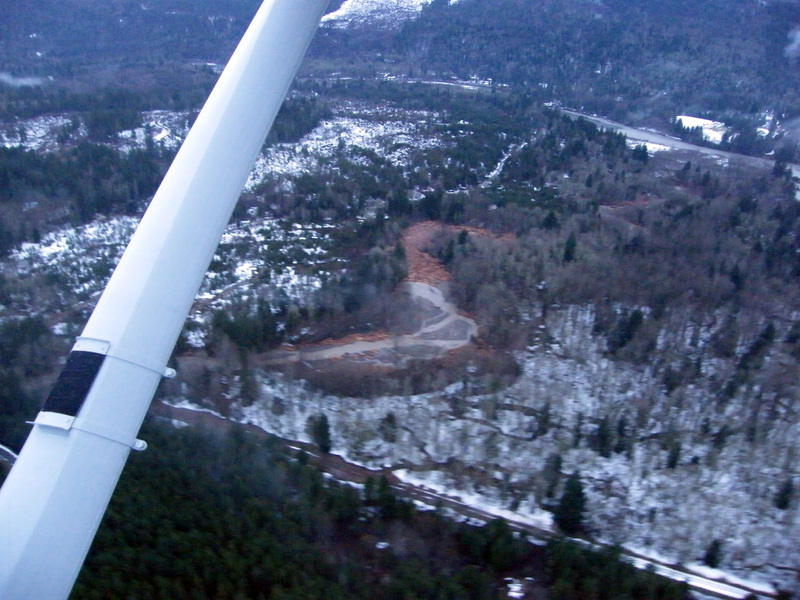 The Rock Creek Landslide (also known as the Skamania, Stevenson, or Piper Road Landslide) started in 2007 probably after heavy rains hit the area in November of 2006. 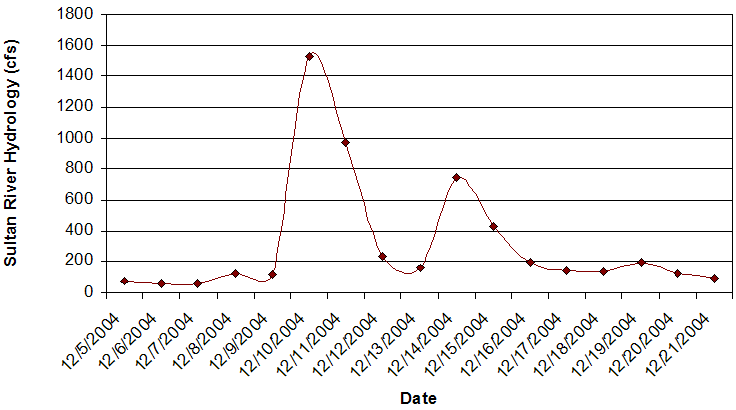 Movement started to accelerate in February of 2007 and continues to today. 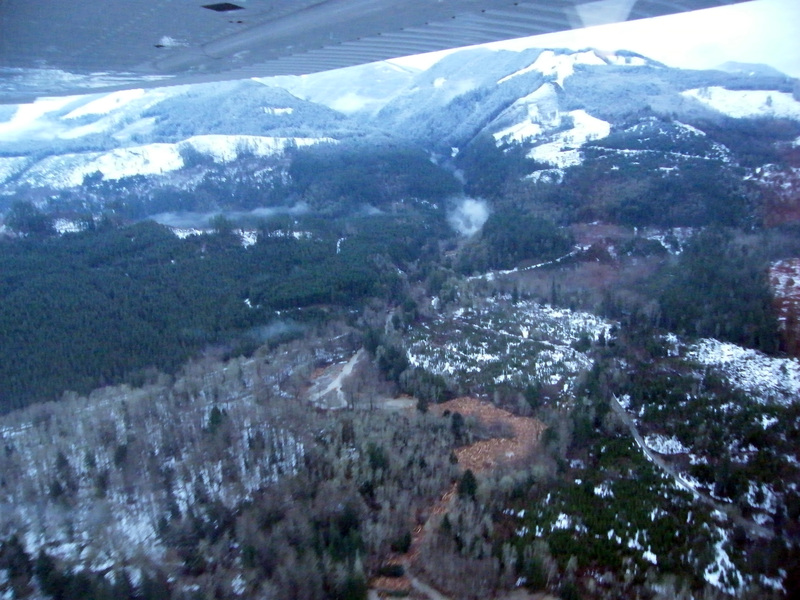 The Piper Road landslide is located north of the town of Stevenson, located in Skamania County. The landslide is situated on the eastern side of Rock Creek near a waterfalls. This photo was taken shortly after the landslide started to become more active. The landslide itself has started to cut back into the bluff. 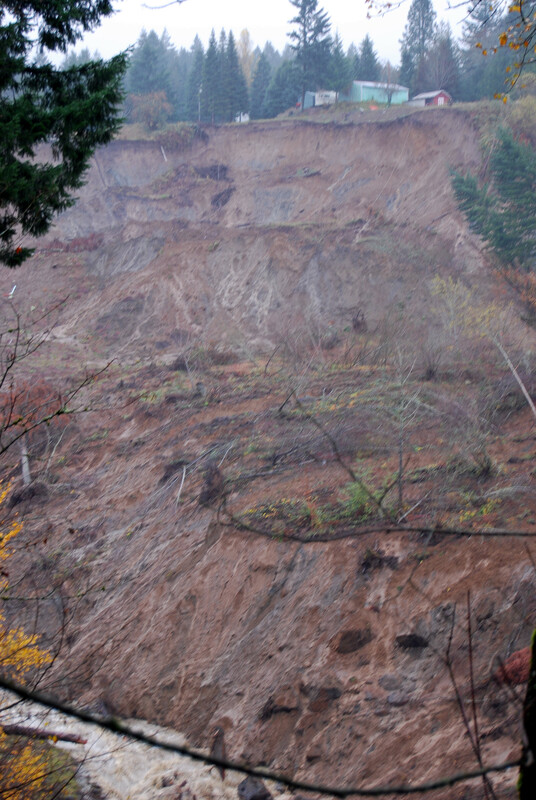 DNR Division of Geology and Earth Resources Geologists investigated the landslide at this time to determine clues to the landslide and possibly mitigation to help reduce or stop the landslide movement. 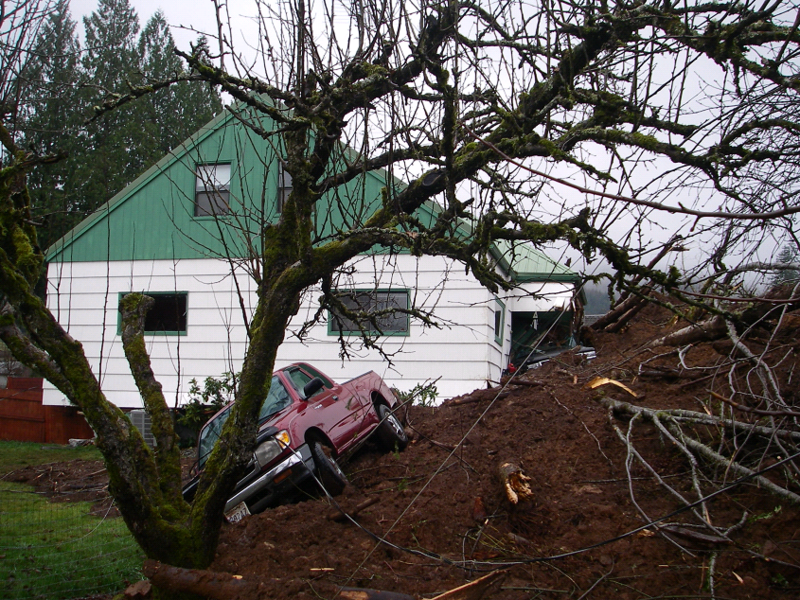 At this point, the landslide had destroyed one house (in July of 2007) and the town of Stevenson was desperate for aid and help to mitigate the landslide. 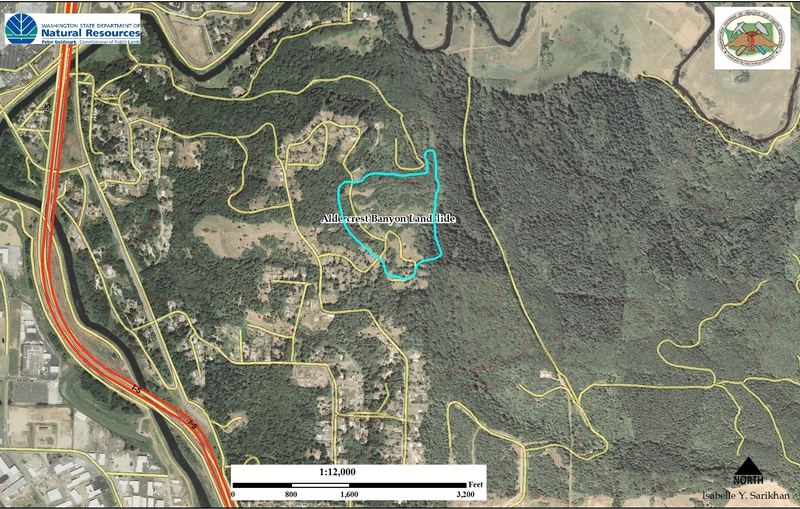 The landslide was no longer threatening only houses, but now threatened to destroy a road (with utilities below) and inundate a sewage treatment plant. 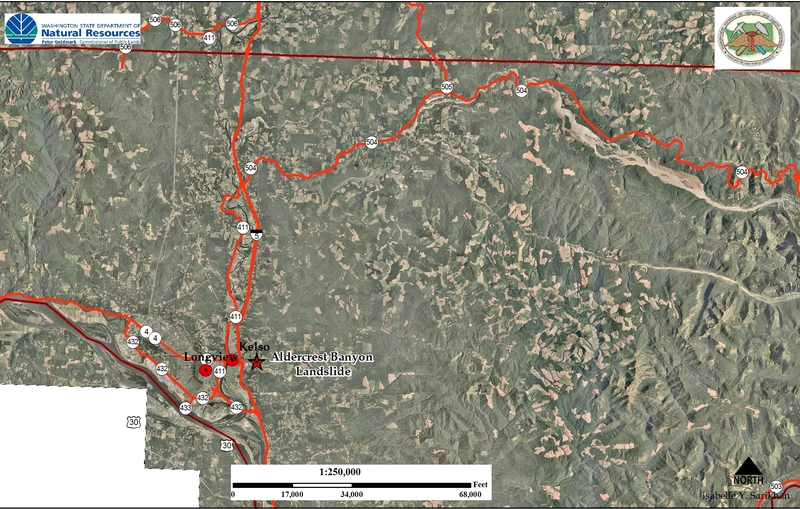 If left unchecked, sediment would continue to aggregate and threaten to take out the bridge of State Route 14, which is one of the few points that connect major utility lines between eastern and western Washington (such as a natural gas pipeline). 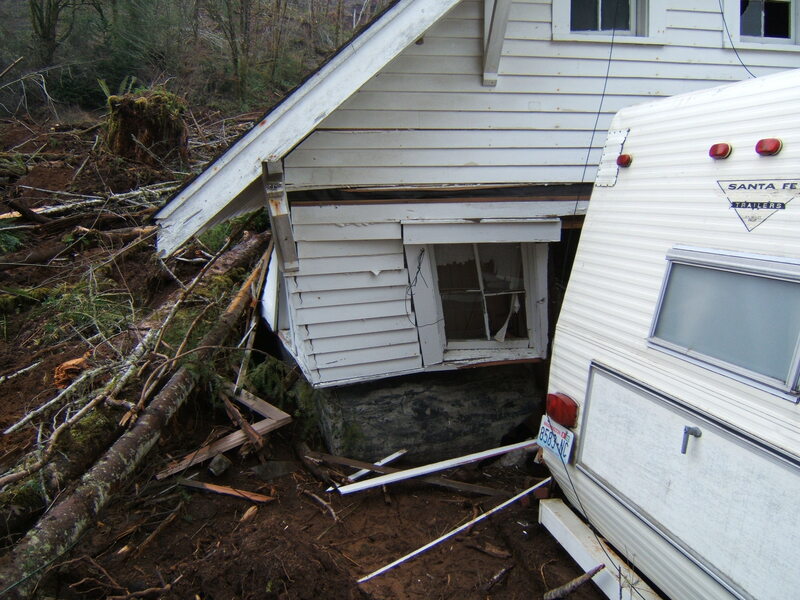 Unfortunately, no aid was forthcoming and Stevenson was left to deal with the landslide on its own. I think the quote was (in a conference call regarding the landslide) something akin to “larger towns have been destroyed or abandoned by landslides”. It is, perhaps, the unfortunate result of building in unstable areas. The long term problems might be bigger than losing a couple of bridges and a sewage plant. The Bonneville Dam is located just downstream of Stevenson and Rock Creek drains into Lake Bonneville. Sediment from the landslide is flowing into Lake Bonneville, which can impact fish populations and slowly inundate the lake and create a sediment headache down the road (of course, this could be dredged out). 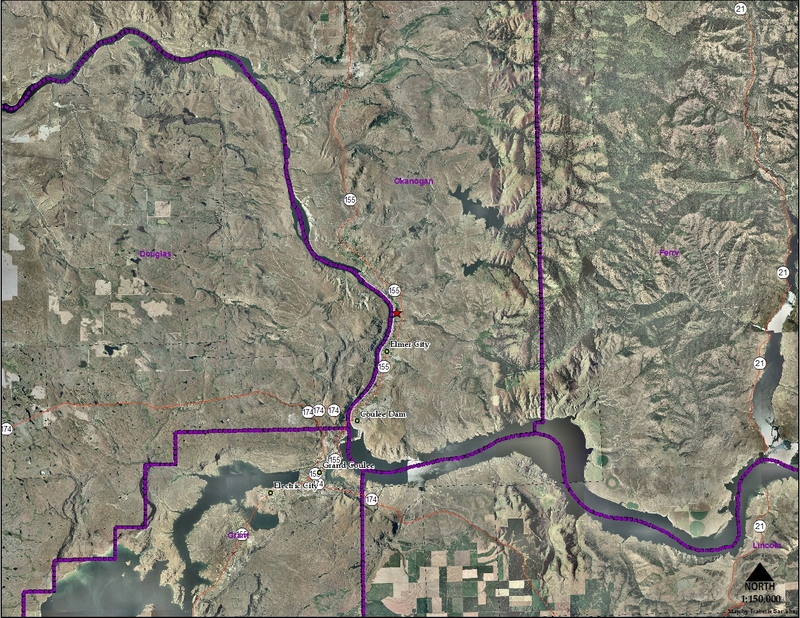 If the sewage plant is impacted, raw sewage could flow into Lake Bonneville (as far as I know, it isn’t used for drinking water), which could lead to things like an algae bloom or dead zones, anoxia, or just misery and destruction. Granted, probably not enough sewage to do that in such a big lake, but worst case scenario. 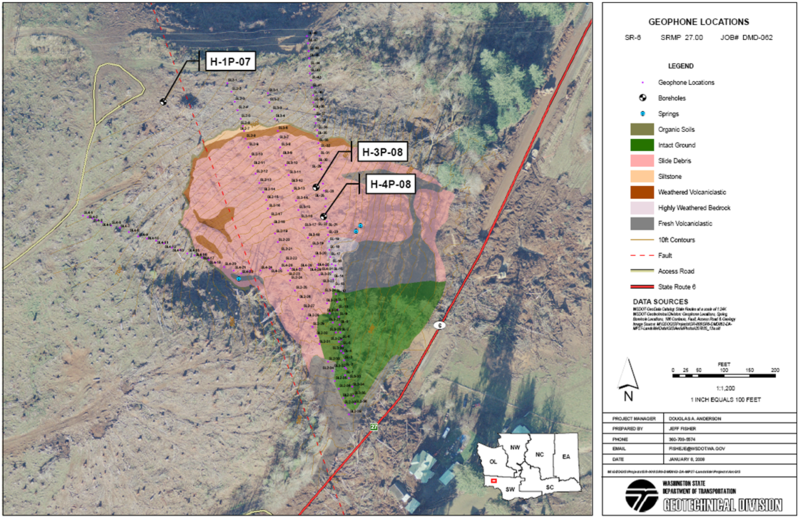 The landslide is located on the Bonneville/Cascade Landslide complex and is probably the result of continued movement and activity of the landslide. 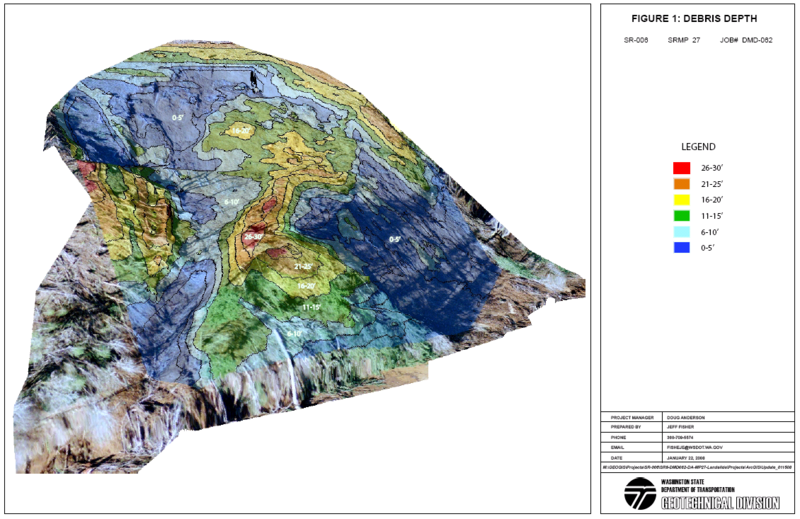 As in the Greenleaf Basin Landslide, a combination of higher rainfall and geologic setting probably resulted in the landslide movement. Erosion of the toe of the landslide by Rock Creek, overtime, probably reduced the lateral strength of the landslide and eventually resulted in a breakdown in resistive forces. 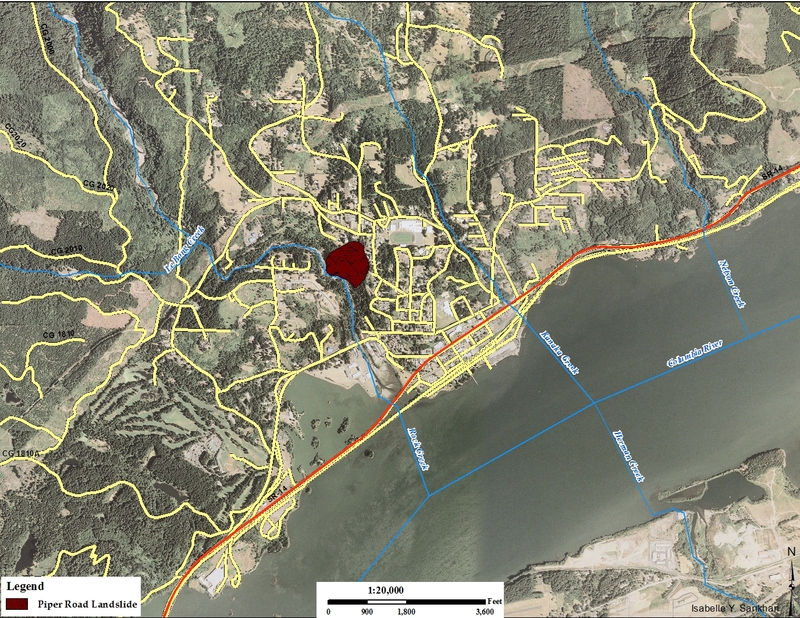 The geology of the landslide is well covered in this report by Mark Yinger Associates. The Rock Creek Landslide Website has been established for the Piper Road landslide (with webcams fixed on the landslide) and additional images.